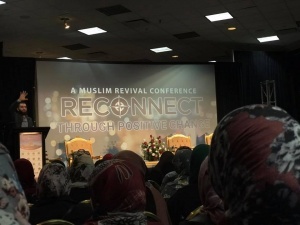 More than 2000 attendees gathered in the Edward Hotel and Convention Center of Dearborn on October 13th for the first annual Reconnect Conference, hosted by MY-ICD and AMLC. These youth saw a niche in the market; the need to host a large conference in Michigan, a state with the largest Muslim population in the country. The conference theme, Reconnect Through Positive Change really left a large crowd inspired to implement positive change in their lives. Just a few days before the convention, the MY-ICD proudly announced surpassing 1000 tickets, as the registration numbers continued to sky-rocket. The team behind this incredible convention consisted of over 70 volunteers, from nine different cities; Dearborn, Detroit, Hamtramck, Ann Arbor, Columbus, Toledo, Flint, Dearborn Heights, and Grand Blanc! The 20-30 hours weekly that this hardworking team of youth put in the planning, ever since Ramadan, unquestionably did not go in vain. From the sophisticated stage set-up to the smooth execution at the registration booth, it was merely remarkable. Marketing was taken to another level; with a motivational promotional trailer, ticket booths at Friday khutbahs in all the local masjid, and of course their various social media platforms, it was no surprise that many people flew in from across the nation. With over 20 speakers, 4 entertainment artists, and more than two dozen vendors of all kinds, it really was a memorable day that went down in Dearborn’s history. 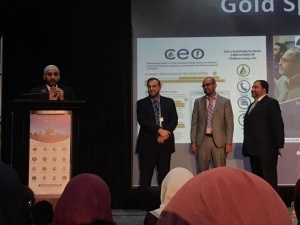 The conference held an entire parallel track in Arabic, with incredible speakers from across the US, including the ICD’s very own Imam Dr. Abdelhamid Salem, Imam Dr. Mohammad Qatanani from New Jersey, Imam Dr. Ali Suleiman, Imam Dr. Muwafaq Alghalayini, Shaykh Hamood Afif, Shaykh Abdulrazaq Alsayid, and Shaykh Majdi Bdeir. 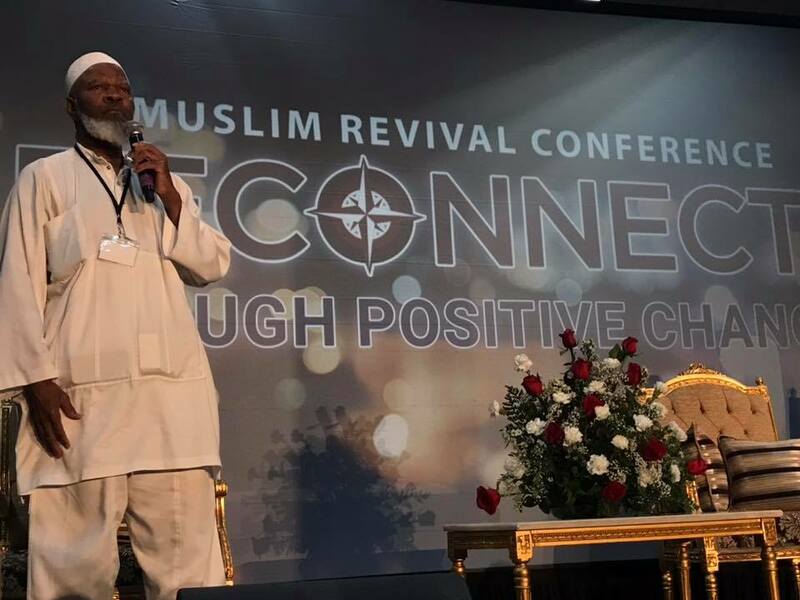 Imam Siraj Wahaj, beloved to far too many, gave a treasured talk. “How close to Allah do you want to be? Worship Him as though you see Him. Strive. Struggle. Worship,” he said profoundly shaking one to their core. Ustadh Majed Mahmoud emphasized the importance of learning about the life and characteristics of the Prophet (saaw) in order to truly improve in one’s character. “Reconnect with the Seerah of the Prophet Muhammad (SAW).” He encouraged all the attendees to visit the bazaar and not leave until they purchase a copy of the Seerah of the Prophet (saaw). After a lunch and Salah break, the program resumed with many more esteemed guests. Through life’s vicissitudes, one might find themselves feeling down, and lacking direction. Shaykh Suleiman Hani’s talk truly hit home to many. “As long as your heart is beating, don’t stop returning to Allah (swt),” Shayk Suleiman Hani said in his uplifting lecture, The Road Back to Allah. Imam Siraj Wahaj, Ustadha Haleh Banini, Ustadh Majed Mahmoud, Shaykh Suleiman Hani, Imam Mohamed Abutaleb, Ustadh Mohamed AlMasmari, Ustadha Yasmin Mogahed, and Ustadh Ubaydullah Evans were of the many honorable guest speakers who came out to benefit the community. The MY-ICD Team made sure to provide the audience with the most up to date version of a convention program: a phone app. Many attendees were impressed with the ability to access the entire program, list of speakers along with their biographies, sponsors, and more on the Socio app. Moreover, the attendees had the ability to rate speakers, leave reviews on sessions, and give feedback on the convention. The team made sure to create a video to teach attendees how to download and access the event. It was truly impressive. If you were impressed by the program, the entertainment session that began late at night was quite a pleasant scene in and of itself. Spoken word artist Boonaa Mohammed, Artist Muslim Belal, and Acapella Artist Ilyas Mao performed and definitely impressed the crowd. However, what took the entertainment session to another level was the one and only, Humood Alkhudher. They call me Humood Vegetable when they translate my name,” he said, as the audience roared into laughter. He threw in a few more jokes, like the person who posted on his Instagram account that “I’m your biggest marwa7ha (the Arabic word for a fan you’d use in your home)” which definitely lit the room. He, along with a very ecstatic and jubilant crowd, sang several of his world-famous songs. Shaykh Mohammad Almathil recognized Brother Sufian Nabhan, the ICD Director, and Brother Khaled Saleh, the ICD Youth Director, for being at the forefront of facilitation at the masjid. It was definitely a day to remember, and one that many anticipate reoccurs every year! “I was so close to not attending, and I can’t express how grateful I am that I went! It was very beneficial and a fun social gathering we truly needed. I’m already looking forward to next year,” said one attendee expressing great joy on her face. What was the most rewarding part of organizing this historic conference? We’ve heard from many attendees that they’re looking forward to this next year. Is it in the plan? Will you do anything differently?  What was the goal and vision of this conference, and has it been fulfilled? One might assume that a team of hardworking youth would be so occupied in the planning and preparation of such a large conference that they would put their other programs in the masjid at a halt. Nonetheless, they did not fail to continue hosting incredible and unique programs, such as MY-Mental health support groups, a weekly IlmNight series, semester-long programs for the young youth, and much more. It was a long day, filled with laughter, tears, smiles, and an event that will not be forgotten. Until next year’s Reconnect, keep an eye out for other programs and events. For more information about MY-ICD Youth, and the incredible programs they facilitate in the Southwest Michigan community, visit the website, icdonline.org, or find them on Facebook at Islamic Center of Detroit. Why Were The Tapes Destroyed?